Although my wife has been taking some of my time over the last two weeks, I have still been able to make progress with the module. In particular, I have been able to come close to finishing a puzzle I had in mind and am very happy with the final product. Furthermore, I have been taking a closer look at some prefabs, because I have made the decision to include these where possible, simply to expedite the process of creation. Like most of my puzzles to date, I have made use of the ability to create GUIs in NWN2. Furthermore, I have taken on board the comments over the last couple of weeks and concentrated on a puzzle that only involved simple logic rather than anything too convoluted. 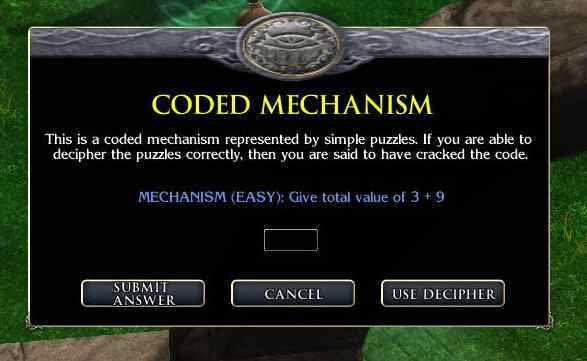 I have also added a new feat as an option to aid in this type of puzzle as well as offer the player an alternative way to bypass the puzzle by buying and using "Decipher Devices". 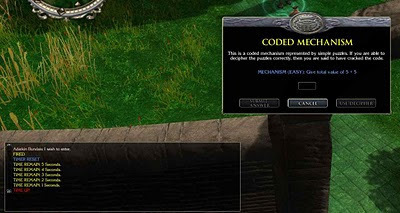 Notice that the player is given instructions and a warning that they are about to start a TIMED puzzle when they first encounter it. When the player decides to start decoding the puzzle, the question is given according to a specified difficulty level and a TIMER is started (unless the PC has the Expert Decoder feat). Each question is randomly set according to its DC at each attempt. The puzzle comes in 6 parts and the player must try to answer all parts, either by answering each question correctly or using a Decipher tool to bypass the current puzzle part. The TIMER counts down in the CHAT window. 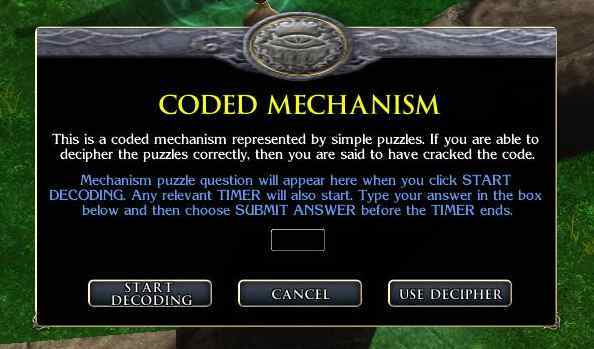 The player may attempt the answer all the while they have time, even if they make a mistake. The TIMER varies in length according to the difficulty of question asked. The SUBMIT ANSWER button is disabled when the TIMER runs down. 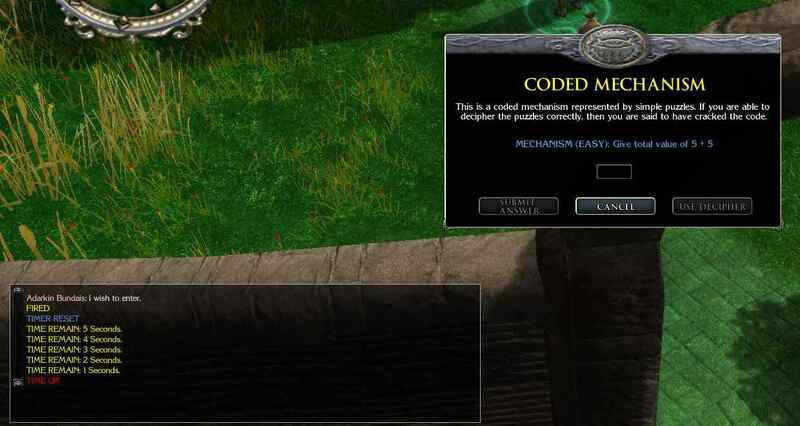 If the PC has the new Althéa Expert Decoder feat, then the TIMER is disabled and they may take as long as they need. Here is what the Expert Decoder feat looks like. 1) I was afraid they may be seen too often in modules and put people off playing if seen again. 2) I was hoping to be able to design all areas myself. However, purely for practical reasons, it makes sense to make use of other people's work where possible. After all, I can still make tweaks and discard bits I don't want or need. Furthermore, I also reasoned that by the time these areas were encountered, the player will hopefully be too involved with the story and game to be put off by a repetition of a scene. 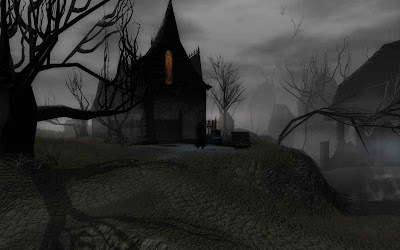 This is a scene from SGK73 "Just Add Encounters" prefab. A reminder ... if you haven't voted in the poll yet (on the left hand side), then please do and feel free to comment. Only two weeks left! I think you know my views on prefabs! As someone who struggles with good area building, they are a godsend, and there's no way a project like the one I've been doing for the last 10 months would have been possible without them. But each area I speand at least an hour tweaking, playing with before using. 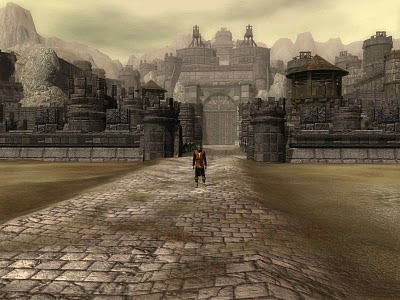 I think context is crucial for them not to feel too common - a player told they are entering an orcish stronghold and fighting orcs will experience the same area differently if suddently the lighting is darker, the sounds and music spookier, and its an abandoned fort filled with undead. Besides, despite the amount of prefabs, they have actually seen very little use in the community modules - i think the 'overuse' factor is overstated. Yes honestly there are more prefabs then their are actual campaigns to play. I've yet to see the same area twice. Not to mention its a simple matter to do a replace all on the textures. Well, half my campaign is prefab. Like wyrin said, nothing wrong with that. It saves massive amounts of time. I have to agree about them being a blessing ... the outdoor areas especially for me. I may try some tweaking, but won't mess with them too much. I have used the new GUI system quite a bit, and I hope it will add a great dimension to gameplay. I will try looking at a few others in time. I did see some others, but did not like them all ... or they were too specific or complex for my needs. Actually, I did notice an area I was looking at (interior) did feature in your module when I was looking at it. :) So, I suppose I am definitely not alone in using them as everybody says. I said do a "replace-all" on the textures, I trust you know this is an automatic function that takes five seconds and is reversible? The prefabs are nice. For the SOZ holiday project that was all I used. It was great to be able save a huge amount of time. With some costumizing adding removing placeables, chaning lighting and adding sounds they can quickly become unique areas. I like the puzzle gui they are a neat take. Mentioned that they will be logic test, but have you considered for a few having to find scrolls or hidden books or really any item that will have a passcode for a certain puzzle. For a non-plot bonus treasure. Hey I have a question about your custom text UI. What XML file would I need to use the SOZ party chat window, but just make it fit more text? I think I found the nwn1 style one (quickchat.xml or something) but I am going to be using soz chat style instead. I believe the xml file is partychat_ol or partychat. partychat.xml does seem to be the file. No matter how big I set the portraits they stay the same tho, they just overlap and try to squeeze into the UI. I thought I had set the overall window to be wider and longer as well, as I added 100 to 200 to each width I found.